Edited transcript of a lengthy 1972 interview with Stryker. Conducted by Robert J. Doherty, F. Jack Hurley, Jay M. Kloner, and Carl G. Ryant. R: Could you tell us just briefly about your background before you went to Washington in the thirties? Now, let’s see. After I got out of high school, I started to go to the Colorado School of Mines. I went one year; I didn’t like it too well. And then I went back for the second year. I made up my mind that I was not going to be a mining engineer. I was not cut out for it. My brother, Mitch, older than myself — we got into ranching. And I went in with him, we bought some cattle. Have you ever been in Montrose? Well, there was a very interesting spot that was a lot of open land and heavy grass. A beautiful spot up near Uray, and we got in up there and got ourselves by. It was the kind of land you’d have to stay on, like a homestead. We got ourselves about eight hundred acres. R: Now when was this? Right before WW I? No, I was back from the Army. So we picked up about eight hundred acres in there. And my brother and I started in. He ran the ranch down in the valley and this was up on top of the mountain. My job was up there putting in fence and getting cattle in to lease. We’d let their cattle in there to graze and we’d make a little money off of that. So I spent most of my summers up there and I was alone a lot, but three horses and a dog, and lots of fencing to do, and lots of barbed wire to stretch. It was a very nice experience. I put in about seven years on that and it was an extremely interesting thing. Lots of time to think. We had a little shack up there, and occasionally the coyotes would come down chasing the dog and I’d get out in the middle of the night and help him chase the goddamn coyotes off. So, there was lots of interesting things going on. And then I got restless. I had places where I could go and visit and stay all night with people, and get a free supper and have companionship. I remember I went over to this one family that I knew very well. The older boy was in class with me and his sister and this Frasier girl had just come back from teaching and they came and stopped there. That night I walked out around and took this girl out. We walked out under the moonlight and looked at the trees and talked. I had no idea what was going to come out of this. Her father had a big ranch out on the Mesa — Fruit Ranch. So I got to going out there and they had a nice great big davenport. I could sit there and with a reasonable amount of affection I could deviate a little once in a while, and so we had quite a time together. I got $2,800 and went back and told her. I was gone two weeks. I said, “Now we can take off and we’ll get married.” That was it. So, we took off. We went up the narrow gauge and went up to the change-over to the broad gauge and took our way back down, headed for New York. We stopped, after all, ’cause I told her you can’t be newly married without a visit to Niagara Falls. That’s always done. We went there and then we got back. And later on my bride said, “I couldn’t hardly keep the tears back. I was so upset all the way down.” That was quite a long trip down from up there down to New York. And she said, “You didn’t even sit in the seat — you just floated down.” I already had lined up with a man in Denver who had ties to a settlement house. We went then to a big settlement house. Yes, Union Settlement House. We went there and she got a girls’ club to take care of. It was a place where a lot of workers had lunches. They didn’t believe in what they were doing, but that’s all right. And then later on they gave me a club of twenty boys. And I’ll never forget one of them. We just got settled in, and this guy told them I was a cowpuncher. Of course, as an assistant director, I could have killed him. They were just little kids, you know, about fifteen or something like that, and this one boy looked me over for a minute after this guy had introduced me as a cowpuncher. This little devil said, “I bet I’ve seen more cowpunchers than you’ve ever seen.” I said, “The hell you have — where?” “In the movies.” Well, that started it. I had them for about four weeks and they were wonderful. One year at the settlement was all I wanted. . . .
H: You were at the same time taking courses at Columbia? Not that first year. I was busy down there at the settlement house—about all I could do. Too many damn things going on. So I told Alice, “Let’s get out. I want to leave.” I was sick of it. It was a nice place. It was right next to Third Avenue. And there were the pushcarts and you could buy your food cheaply. We went around a lot. She had quite a lot of time and she was on the roam a lot, looking over New York. I was interested, too. We went back, and I was registered at Columbia. Went up, got myself straightened out and that’s where I met Rexford G. Tugwell. That was my start. I had a little bit of advance credit from the Colorado School of Mines, but not too much. And so, the first thing I knew, I was teaching. R: About when was this? Well, this would be early twenties. R: But you had known Tugwell for a long time? No. When I registered at Columbia, I was new. Tugwell was a new man to me. I hit off with him. He was a quiet man and hard to know. So, when I was first in there he was not exactly distant, but reserved. I had a sophomore class, so I did advanced work on it. So I had these students in economics. Things got along very nicely and I enjoyed my work there. Little by little, Tugwell came up with the idea of a book. You may know the book. We — Tugwell, Munro, and Stryker did a book called American Economic Life (1925). You can take a look at that book if you want to. That’s where I started. That book is a very important book — cause that was the start of my interest in the visual things. My wife did the charts for it. She worked on it too. K: It has many photographs in it? Oh, yes. It was loaded. H: It has Lewis Hine pictures in it. You knew Lewis Hine. You see, I met Lewis Hine early. Lewis Hine had a hell of an effect on me; a terrific effect on me. K: Did you know Lewis Hine before you worked on the book? No. Well, I had met him. You see, all these things came together at that time. H: Columbia was the background for this whole thing. Hine was a student of his at Columbia. Yes. He took pictures for me. He did a lot of pictures around the place for me. The book was my start. I told Bob [Doherty], “You can put that book in your library up there and realize that was one of the things that got me going.” There was a second and a third edition. The first one was just pictures that I used in classes. There was a history professor and he had a remarkable library of [the] Yale… [Pageant of America] Series. And he gave me a key to his office and I lived in there. A wonderful set of books. So I spent a lot of time on that, and that had a terrible effect on me. And then, of course, doing this book with Tugwell — they wrote the book — and hunting the pictures, and then my wife doing the charts and so on. R: Did you find it hard, when you were doing this first book, to find the pictures that you wanted? The right illustrations? I handled them. We’d go downtown and go to a store or someplace. I also found two or three places that had old photographs and so I was just on the run all the time. Alice, my wife, would go out and look up places for me. She had ideas and she’d try to locate a place so that she could take me down to it. Between the two of us, why, we worked on that book. But the book was the start. Do you remember the little manual that I made for my students? H: Yes. That’s another fascinating story. They’d put in a system of taking students out on trips around the town to show them economics functioning. H: Roy was in charge of this program. Also, I was tied to the Professor of Labor problems. That was a great contributon to me. You see, they had a labor professor, a very brilliant and very interesting guy. I got a lot out of him. And then I’d let these students out all the time. I guess I was a good teacher because I was alive. I’d say, “Now there are five of you who want to go out on a trip on this.” And I’d divide them up and say, “What do you want to see?” The Ford plant was right across the river from us, so we would go over there, and there were all kinds of places that we could go. H: And there was the stock exchange. Yes. There was a place where all of the bums stayed down the Bowery there. I could pick out guys carefully, knowing we were gong to spend the night down there. And we’d go down and stay with the bums, or go down to the big produce market. It was across the river. It was a huge produce market. God, it was a hell of a place. I’d take the students down there. And I’d take the boys that I knew I could take down to where those bums had those free places to sleep. We wouldn’t sleep there; we’d just talk to them all night. And I’d take them out to the bank, and the Federal Reserve. H: They were on a picket line once? Damn right, they were on a picket line. It was a curious experience. I was teaching, there was the book to do, there was illustrations to do. New York was there waiting for us, every street, every alley, all over the place. And these students — I’d divide them up, I couldn’t take the whole damn class. I’d say, “Those of you that want to go, you’ll have to sign up here for it. I can only take so many of you, now show me you’re interested.” And so, I was running about New York, getting things I got for this book, and I was having fun with the students and they were getting some additional things in education, and so it was quite an affair. I had a very close relationship with these classes. I put in there; I got my degree. Then Tugwell moved down — this was when the New Deal was starting — and Tugwell moved down to Washington. H. You took your Bachelors? I took my Bachelors. That’s as far as I’ve ever gone. H: You did work beyond that? Oh, hell, yes. Right. I just wasn’t interested. H: You never put it all together. No, I didn’t. I didn’t want a degree. There was too many things that I was interested in. I wanted to get out of New York. But I went down to stay one summer with Rex Tugwell — his wife and family had gone. It was a very interesting summer, because it was then that our relationship had warmed up. And that was a godsend, because that was the basis of what happened later. And so, I spent the summer there with him. Something I’ll tell you about is that the Department of Agriculture were nice people, but orthodox, narrow-minded, and they were a nuisance to you. H: They were interested in the big farmers. Yes. And they didn’t like some of the things that I was doing. Well, I just made up my mind that the orthodox boys over there in the Department of Agriculture weren’t going to tell me a goddamn thing. I knew I didn’t have to take any guff off of them, so I just dodged them. K: Roy, can I ask you a question? K: How did Tugwell envision the FSA and how did you see it? The directions of the FSA at the very beginning? I don’t know what Tugwell was thinking about it, to be honest. But, I was taking them pictures. I had done this book. I was interested in pictures. I was interested in taking students to places to see. And the photograph was an idea. Right away, that book had a terrific effect on me, just a terrific effect. And then the picture began to be the thing of my life. The photograph was the way to reach your group, to reach the people. R: Were you responsible directly to Tugwell? H: This is that first year. You were still working at the Department of Agriculture. Weren’t you under Milton Eisenhower right then? Oh sure, but I could get along with Milton. He was a nice, tolerant guy and he understood that I was a renegade. H: Tugwell was what — Assistant Secretary of Agriculture? And you were living with him when you. . . ? That one summer there I was living with him. You’re right. We pulled up stakes and moved down there. That was the start of the whole business down there with Tugwell. He divorced, and married his secretary. She was a secretary at Columbia University. And she had a hand in helping me grow up. She was my friend in the college and in my work with Tugwell because she was the department secretary there. Grace Falke. She, I owe so much to. Too many things. When Rex sometimes didn’t quite see, didn’t want to be bothered, Grace did it. Then she married him and she was his secretary, but also his wife. So, things began to move and the depression was on. I had been doing things for publicity, and then, all of a sudden, this thing blossomed. We were out in the big open spaces. 1 was getting photographers and I was given a spot over there. We had a place to go. We were adding photographers and it wasn’t long before we were in action. I was the boss. I had about four or five photographers, Arthur Rothstein and Russell Lee, the engineer who was down at the University of Texas, and Dorothea Lange, who didn’t come. She stayed in California, and she didn’t come for some time. H: Was Walker Evans one of the early ones? Yes, he was one of the early ones. Walker and I used to walk home and argue. Walker was so damn conservative in so many ways. We had some wild times. Things began to move. The farmers began to go. It was a complicated thing and it would be quite a job to have to dig it all out for you in order to give you the exact thing. But, just accept the idea that we went to work. My job was to direct. I wrote lots of scripts. My job was to get the way to go out. They had books to read. I rode them on books. They had to get their background. Some of them went out on shorter trips. Russell Lee went out for a year and never came back, ’til the end of the year. I went out and met him once, I’ll never forget. He was up in the Northwest, up by Chicago, and I went up. He and I did some work up there together and we had a very wonderful experience. We were coming back down and he stopped and he saw a little woman in a farm there, in a little old house. He stopped there and wanted to know if he could take her picture. She said, “What do you want my picture for?” And he told her. I kept my mouth shut and just stayed back. “Say,” she said, “How would you like to have lunch? I’m going to have lunch for you. You folks are going to stay for lunch and like it.” It was Russell she liked. She was an interesting woman. She said, “I’m going to invite some of my neighbors over here. I’d like to have them meet you fellows.” They came over and we stayed. There was plenty of time and it was quite an experience. But I didn’t get out much. There were a few trips I had out. But the way Russell handled that girl and the way he handled everything there was something, and it taught me a lot. It was interesting to see. Because I had to stay back, I could feel ready to direct, ready to write the scripts. H: Russell Lee at that time, had been on the road at least eight months? H: It was unreal how long he could stay out. He knew when to come in. H: Had he and his first wife Doris just broken up when he took the job in this thing? She was up at Woodstock, wasn’t she? She was a successful artist. That’s right. And then he married this other girl that was a godsend to him. She’s a marvelous girl and she was a godsend. Joan was wonderful. K: Did Dorothea Lange send you her photographs at this time? Yes. She was sending. I began to get these photographers lined up, and Dorothea sent her famous picture of her woman. H: Did you see her work in Survey Graphic? Survey Graphic was a very, very strong effect on me. You can put that in your interview. They were a great help to me. During all this time, a big help to me. K: Did you have virtual autonomy to develop that program on your own? As I built the laboratory… we had a wonderful laboratory staff. I had the nicest little secretary you’ve ever laid your eyes on. Tough little devil. She was a little boss and she ran me sometimes ragged. Listen! You can remember more than I can. H: I’ve read all your mail, Roy. They were pushing those children and going to California, and they made it. I got a memo from them — a letter that they made it. That’s all I can tell you about it. But I tell you, that thing had a terrific effect on me. Russell wanted to take pictures and I said, “No, you can’t. You just put that camera back.” There was something about that situation I saw, that I couldn’t stand the thought of a photograph of those two people and their two baby carriages. I didn’t want it photographed. It was crazy, but I couldn’t help it. It was a strange quirk in me not to have that photograph. I was so touched, so involved — it went so deep into me. Well, the key region at that time I started to work was the whole country across from one side of the States right across to California. Everybody tried to get out of the mess they were in down there. They were starving to death. Their ranches were gone. Their places were gone and they had heard that California was the mecca, on the West Coast. K: Did you send photographers up to New England? Yes, of course. Arthur Rothstein went up there. Photographers came back and they took their turn up in New England. K: So you saw the migration as one key problem. Well, that was one, but we also saw other parts of the United States. You see, we had a summer place up in New England, so I wanted them to go back up there. Arthur Rothstein came up and stayed with us. We had an old house up there in the northern part of Vermont. So Arthur came up. He took pictures up around there and went up through there, and two other photographers came up around there. H: Every different section had its own individual problems. H: In the South, you had the tenant farmers problem. In the center part, the dustbowl problem. Out in the West, the migrant farmer and in the Northeast, farm displacement. H: There really wasn’t a section of the country that you could afford to just ignore. Out on the West Coast it was basically Lange’s country wasn’t it? K: We were talking about the beginnings, the very beginnings, of the Farm Security Administration when you hired four photographers. And you’ve mentioned scripts, but you really didn’t go into any kind of detail about how you worked with scripts. Or, you didn’t really talk about the way you built up the department and what directions you were interested in. Getting the photographers to work and things like that. We were down in Washington and were getting ourselves organized. Literally, we were trying to get ourselves settled on that floor. We were trying to get a laboratory established; we were trying to get ourselves established. We had some pictures in and we were actually checking pictures on the floor. We didn’t have a place; we didn’t have an office; we didn’t have anything. R: Didn’t you move into the old Agriculture Building? We moved into the old Agricultural Building and that’s where we were first. And we were in the regular Department of Agriculture there. Our cabinets were outside. Our tables were outside. We had no facilities at all. We were just getting along the best we could. Then it wasn’t long after that before we got a building across the way. I forget what the building was but it’s right across from Agriculture and the second floor was given to us. Then we went to work and built a very nice laboratory. And built our file room and built my office. I got a secretary and got my own little office. So that was a big step. From that point on, things began to move on quite rapidly. Tugwell was moving in down there at the same time. That was an important time because, really and truly, we were actually laying pictures on the floor and sorting them out. I’m not kidding you. But things picked up rapidly after that. We got our laboratory built fairly early. They built a damn good laboratory. I mean this right sincerely, we were most fortunate in finding ourselves three top rated laboratory men. I can’t tell you how important they were. They were so damn good that they just covered everything. R: Did you have any trouble getting the various photographers that eventually joined you to come? Were there problems in that, or were they excited and willing to come, or was it largely the depression that made them come? No, no. They had problems. They brought them. But they were not serious problems. The problems were getting their supplies and getting their prints. I’d sit down and I’d discuss prints with them when they came in. When a new set of prints came out, I’d discuss it with them. K: How did you assemble your photographers? How did you get your photographers together? I didn’t get them together. It was very seldom that those photographers ever came together at the same time. You mean how did I find photographers? Well, Russell Lee came in one day to see me. Somebody had sent him down. I took him home and talked with him for a couple of evenings and I just smelled and said, “There’s my man.” It was as simple as that. I liked him. And I was damned sure that I was right. And I was right. R: Is that pretty much what happened with the others too? They happened in and you could sense which one? Well, now, that’s going to completely different extremes. John Vachon came in and didn’t know much of anything. He sat behind the desk and put the pictures in the places where they belonged. He did that for a while and then he grew up pretty fast. He could sell pictures. He and I had many a conversation together, talking about the future and what he might be able to do. I said, after all, “When you do filing, why don’t you look at the pictures? Pay attention to them. Get some idea, and if you ever decide that you want to take pictures, just remember, don’t try to say, ‘I’m going to take pictures like Russell Lee,’ but say, ‘I’m going to learn to take pictures.’ Say, ‘I’ve got some ideas.’ ” Not exactly, but that’s more or less what I was saying to him. I was trying to educate him. I tried to stir him up. And it did. K: Did you feel that your relationship with these photographers was similar to the role of a teacher? Yes. It was a teaching job. R: It really didn’t change when you went from Columbia to Washington? No. Because at Columbia I’d be teaching and we’d be in a certain section of the text book. And I’d say, “Say, what are you kids doing tonight after the class? If any of you could, could you get away and go with me? Let’s take a hike. I want to show you something.” Or, “Let’s take a walk along the river over here and on the docks.” So maybe seven kids could go. The rest of them were in a snarl. Two of them came back and said, “Will you take us out on a trip like that?” Of course I could. K: Then when you worked with your photographers, did you use a similar approach? After what I had done with students, it was the easiest thing in the world to move on over. And then the photographers — they were your students. K: So you tried to help through personal rapport with them. K: You would try to help them grow in the direction that you felt . . . .
Sure. Exactly the same as you do with a student. I had “bull” sessions. I’d pick up a photographer and say, “Let’s go out and have dinner tonight. You come up to the house or I’ll come around to where you’re staying and we’ll have a session. We’ll have a couple of sessions.” The thing is so damn logical. R: Did you find that different photographers had different personalities and style so they might do jobs differently? Yes. I wondered. Pretty soon, when they went to work, I knew damn well what they were, going to do. I could pretty well forecast how they were going to do it. But when they were new — when Russell Lee came in, I was curious about him. I liked him, I liked the forthrightness of him. I liked the way he came in. Russell Lee literally walked into the office one day. Somebody had sent him in. First of all, just in general conversation, I was impressed. Frank, healthy, open, whatever you’d want. We coordinated, just like that. K: Did he do more work for you than any other photographer? I don’t know. As far as numbers go, there’s no use in my trying to say. But he did a hell of a lot of work. K: How did Rothstein come into FSA? He was a student at Columbia when I was teaching. And he was taking pictures for me at the time for the book. Then we got to pushing a little further. K: Did he work with Hine at Columbia? Yes. He was there, you see, as a student. He was taking pictures and I wanted some pictures taken. We started that way. Then he went down with me. R: When people went out to take pictures on assignments, did you assign specific people for specific projects because of the kind of treatment they gave? Or did they just go in order? Well, in some respects, yes. But not as much as you would think. Because, there was a hell of a lot of versatility with all of these people. And with shooting scripts — the directions and conversations before they would go — you had a pretty wide range of a chance of pictures. Now, you knew that Arthur was going to do a certain kind of a thing. And that Marion Post would do something else again and that they would be different. But, that was all right. You wanted that difference. You were glad to get that difference. 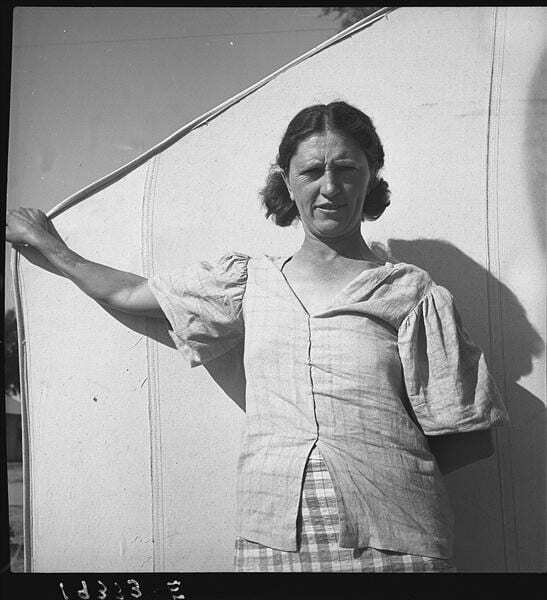 K: Did you feel that Dorothea Lange should photograph the South and not just the West? Well, I would’ve liked to have gotten her out, but her stuff was of such a nature that I wasn’t going to interfere with it. I’d liked to have moved her a lot. It would’ve been good for her, but you couldn’t do it. I went out to meet her and spent some time there and had dinner and stayed. I met her second husband and talked to him a little bit. Dorothea had to pretty much stay put. Russell Lee could go from up by Chicago and he’d go on down [South]. There was a little town down there. I wish I could think of the name. [Possibly Pie Town, N. M., or St. Augustine, Texas.] He stayed down there and did a big job on that whole town. Russell could do that. Dorothea wasn’t going to change suddenly. I went down there with him. It was a very fascinating job. He ran into a farmer. All of a sudden the guy discovered Russell was asking about pictures, and then, all of a sudden, he turned loose and Russell stayed on for about three or four days, and he took him around and he did a whole lot of agricultural pictures because that guy was enamored with Russell. K: Were you particularly looking for photographers you felt would have a rapport with people? Sure. Damn right. And when Russell showed himself, there was no second thought that I didn’t want Russell. And Jack Delano the same way. Jack was different, but he had that same ability to see and to have a rapport with people. K: Were some of these photographers quiet and is this why you felt they had a rapport with people? Because they didn’t intrude? I think most of them were quiet people, were respectable, were thoughtful, were strange, because they were taking the pictures and wanted those people to do the talking. But if the people started to talk, some of them were more easy to have a conversation with than others. R: Did you feel that, by and large, most of the photographers had good rapport? Did they have much difficulty in getting people to let them photograph them? They each had their own methods. I don’t know what they were. I wasn’t with them. I saw Russell in action. I told you about that. On the whole, I didn’t go out with the photographers. I didn’t have time. It was just as well that I didn’t go out because I think I would’ve been a hindrance. I took John [Vachon] out because I thought somebody needed to start him. His photography was new. I wasn’t sure how it would turn out, but it came out perfectly. When I landed on that ranch, I could talk cattle because I was raising them. The man looked at me and said, “Well, you’re rather experienced with cattle.” I said, “Look, I know what we’re doing.” I had some samples along, some pictures to show him. And 1 said, “This looks like the place that we could get some. Will you help us? Will you let us go?” He said, “Sure.” And he did. But I had talked to him about it. He said, “You know cattle, don’t you?” and I said, “Aw, a little.” So I said, “But my boy doesn’t. I’ll go with him and I want you to help me so we can get a nice story.” We got a hell of a story and the man was delighted. It was just one of those rare things that happen, that John got that and got that experience. It may have never happened again. K: Did some people respond to the photographers negatively? Someone supposedly chased one of them off his land with a pitchfork. K: When you talked to photographers did you develop a certain kind of a feeling about things like reason and emotions? Not in those words, no. I don’t think I did. You talk to them in a dozen different ways. Look, I talked to them pretty much in the way I talk to you right here. There’s no other way about it. Because I’m very sensitive, quite vocal, quite apt to talk, and I’m very responsive to people. K: Did you see yourself in the role of protector of these photographers? Yes. If a congressman had taken out one of these photographers, he had me to deal with. R: Did they ever go for any of them individually? Was there ever any objection to an individual photographer? When we first got started, I had some troubles. I learned how to take care of them — just stayed away from them. I had a rough time there for a short time. No, not exactly. People had projects and they wanted things. And I wasn’t going to go through that kind of stuff where they were going, to begin to tell me how to take pictures — what kind of pictures they wanted. I’d say, “We’re not takin’ that kind of picture.” I had to get out of it, but I had to be careful. I explained to them what I wanted to do, and I said, “Now, I understand what you want and I’d like to help you.” We did actually put men out and help them a few times. It paid off because they were nice guys. They had a tough problem. But some of them were bastards. You didn’t give them a goddamn thing. And I got an instinct for that. I can fast figure out who I’m going to get along with and who I’m not going to get along with. That’s one of my traits and it was worth its weight in gold. K: Did you do the editing? K: What kind of photograph did you personally like the most? That you felt was most successful in terms of the FSA program? Let’s go back to something first. That book I did. People, places — I wanted life in the pictures. Someway, somehow I wanted life in the pictures. I wanted people in the pictures. I wanted cattle in the pictures. I don’t think I could use any better expression — I wanted life in the pictures. K: Did you want the information photographed to be clear or explicit? In most ways, yes. But there were pictures that came in at times that you had to look pretty damn hard and you had to have a pretty good imagination to know what they were doing. Those were limited. They were there for a reason. Because that was good photography. Everything didn’t have to be like a goddamn newspaper picture. We didn’t want that kind of photograph. R: Did you ever get any complaints or interference from other people in the Department or from Congress, because you were doing this kind of picture and it wasn’t the kind for a newspaper? K: How did you feel about the quantity? Were you interested in doing a great quantity of pictures, or a restricted number of pictures that said more? Or did it depend on the situation? I made no comments on how many pictures to take. That was their business. But if they ever took pictures wildly, they caught hell. They didn’t do it. There was no problem. They learned awfully fast that they were there to do a job. To tell a story which might take ten pictures, or ten negatives, or twenty negatives, and so on. As I look back on it now, I recognize how well they did those things. R: All of you worked well together then? K: One of the things you seem to talk about is the difficulty you had in getting quick results. Well, don’t misunderstand me on that. I wanted results — and I don’t like the word “quick” in it. I question the word “quick”. I’d rather a man take a week to do his job . . . if he got thirty pictures. But the next time he may have taken a week and got a hundred pictures. But maybe we’d throw a lot out of the hundred. Maybe the thirty were very carefully thought about and they turned out to be good. You see my point? That was their judgment. That’s why they were hired. That’s what they learned. R: How structured were the scripts you prepared? I wish I had brought down a handful of them that I have saved and let you look at them. Because they are very diverse. I made a remark to one guy, “You know, people sit on their front porches.” My mind immediately began to run — We don’t want a thousand pictures of people sitting on their front porches. I was busy trying to think how I could get a few of those and get good ones. And we got a few dillies. But you had to be careful not to get them going until they went through every town and just shot the thing on their way through the town. K: So many pictures of the people are shot outdoors. Did you feel you’d be too intrusive? Well, I just felt there were limitations to what we could do. Now we did get a few houses. One of the girls found a family. She had a feeling for it. She liked them and they liked her and she took some pictures. K: How did you feel about letting them be photographed, when the photographers did deal with families? K: Was Walker with you then? K: I know Archibald MacLeish has done a book. He came to you and said . . . . Yes. That was a real wonderful thing when that happened. The old boy was wonderful. He had a man working with him, Ed Rosskam. He was the one that was choosing the pictures and he was a very valuable man. Do you remember, we made the mural that went into Grand Central Terminal [in New York], and Rosskam designed that. It’s a huge mural. Cost us a mint of money. It made a hell of a commotion. K: How did people react to it? Very favorably. It was made by a man who had the ability to blend pictures and do a great big huge photograph, if you want to put it that way. A painting. K: Was this before or after the Grand Central Auditorium Show? I don’t know those dates. The exhibit that we were talking about was different — a smaller, a tighter, thing. But this show was entirely different. We got a whole lot of publicity out of it. The pictures were around the room and, goddamn it, we didn’t photograph them. K: Who mounted that show? Arthur and Russell designed it. They wanted to know if I’d go in with them on it. I said, “You’re damn right.” So they came and started in to the files to pick the pictures and then they went down to Washington and made their listings. I’ve got all their correspondence, or most of it. They went to work on it and designed the thing; came back and made the enlargements. We got eight hundred and some comments, all kinds, cussing us out and praising us. K: Then you know what pictures were in the show? No. I don’t know every picture that was in the show. I had the listings that they had, but I can’t tell you for sure what was in the show. That’s the tragedy. We were too new at this business. I don’t know why I didn’t tell them to photograph the wall. Either one of them could have done it. R: You say that you were too new when you were doing it. Do you think your own reaction to the importance or the effect of what you were doing changed a good deal? Well, I learned that you photograph a show. I learned it too damn late. This was all brand new to us. I had too many things that I was trying to encompass. It never would’ve occurred to me. Boy, we never made that mistake again. Once was enough. An error like that thing was enough to last me the rest of my life. I can make an attempt at construction, because I’ve got enlargements of every picture that was listed on the list. K: In the show, were the pictures blown up to different sizes? Yes. Sure they were. But I was too goddamn dumb, at that stage of the affair, to go after the boys. And I guess I depended on them too much. It was a shock when I finally woke up to the fact that we didn’t have any full record of the contents of the show. I’ve never quite gotten over it. K: Did any of the photographers mind at all about cropping photographs at any time? K: Most photographers tended not to want to change. . . . They apparently didn’t want to. They were satisfied with what they saw. And they also had confidence. Now people would crop their pictures and make the photographers sore. I sent notes to people that would do it that said, “For Christ’s sake, don’t do that again.” But that didn’t happen often. K: Many of the photographs tend to have medium tones instead of having very rich, deep, dark, blacks. Was this because they were intended for mass reproduction? Magazines and so on — yes. We were actually trying to get our contact picture within the file. So that when you looked at it, you got a sense of maximum quality. Now, they may come in and say, “We’ve got a special job. Will you make us a special print?” Then we could. We did lots of that. But the pictures that we made, the 8 x 10’s, were an attempt to try to get the photographer’s pass on those pictures. When a set of pictures were made, the photographer passed on them. He had to look at every set of pictures. K: So the photographs were proofed? Oh, yes sir. Every set of pictures. They could say, “I think we ought to take this one out.” And they had final liberties to edit. Indeed. 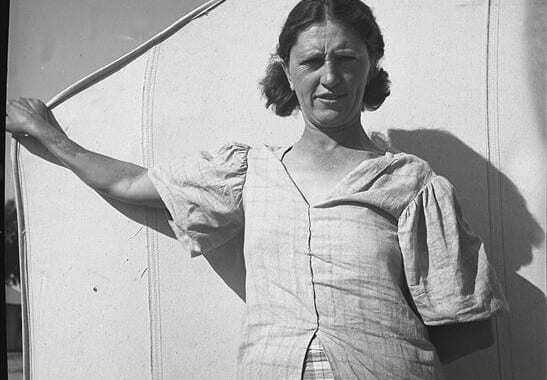 K: Dorothea Lange would send in completed prints? K: Because she was working so far out West? Yes. Now it so happens that somehow or the other, we got three different ones of the mother holding the kid. I’d like to kill those two pictures. I didn’t know they got in here. It’s just that I think she’s got one picture that’s so damn good. What do we want with those others that aren’t good pictures? She sent in the one that I treasure. K: Did she send in the other two? I don’t know how in the hell we got them negatives. As a photographer you can go out and take twenty pictures if you want and select the one that you think is best. And I hope your judgment is good enough, that you’re going to be right. I may see some of the others and I’ll say, “I agree a hundred per cent with you.” Or once in a while I’ll say, “I’m sorry, I don’t agree at all with you.” It just happens that the one of Dorothea Lange’s I got to start, with I still think is a great picture. I think it’s one of America’s great pictures. I don’t think the . . . other two versions of that picture have contributed much. K: Would you want to say anything about what that picture means to you personally? I can, in two words. Mother and child. What more do I need to say? A great, great, great picture of the mother and child. She happens to be badly dressed. It was bad conditions. But she’s still a mother and she had children. We’d found a wonderful family. K: Rothstein feels that “Dust Storm” is one of his most important photographs. Well, I think he’s right. “The Skull” was an important picture, but this was a greater picture. That told dust storms better than anything we had. K: Because of the interaction of the people? They’re ready to get in. That picture without the caption is not going to go anyplace. Words had to be used on that picture. K: How did you feel about captions in the newspapers? Did you have any control over the kind of things said in the newspapers? K: Which magazines did you find responsive? Well, Survey Graphic was one of the real responsive ones. It was a small magazine, but they had the sense of what we were trying to do with a lot of our people. Don’t misunderstand me, a lot of the newspapers did wonderful jobs on the stuff that we took out of the big depression series. Now that’s different. They recognized a lot of that. I don’t want to be unfair. Some of them did very, very good work with using our pictures. I’m not prejudiced against newspapers, but I’m prejudiced against some of them. R: How did the pictures circulate in the newspapers? Did you issue them in sets or did they come down and look at the files? It was a fair combination — our promoting some things, their getting a hold of them, coming after them. A lot of the newspapers had men down in Washington that would come around looking for our stuff. That’s the way it got out. They sensed something different and something new. They sent their men in and we cooperated. We didn’t do like some of the others today — just send them in and hope you get the newspaper. K: Did you have any directives from the Agriculture Department as to the sort of directions to take? No. I went over to talk to the Department of Agriculture and I didn’t find but about three or four guys that I could talk to. They were bureaucrats. D: Did you do any photographing of the subsistence homestead program when it got started? Not too much. Some, not much. D: Would that have really fit into the kind of photography that you wanted to do? Yes, I think so. Some of it would. We got enough of it to get a feeling for it, but it wasn’t a big job of the depression. We were trying to do the depression. We just couldn’t cover everything and that is what we were trying to do. K: Did you find that the photographers shied away from working on federal projects? No, we did some. It depended on what it was. “Down Along the River” [probably the film The River(1937), was a project that involved the Department of Agriculture and it involved a lot of government agencies. R: Were the photographers happier when they went out, say into the South and shot what they saw than if they had been assigned to go out and take a picture for a reclamation project so that you’d have it for an illustration for a book or something? If the illustration was wanted and the book was approved, they had a job to do. He’d been very happy to have done it. But to go out and do that kind of thing — I’d say no. We were not trying to illustrate that kind of a book. It was not our job. R: Did you ever feel caught up in political pressure in the New Deal? To show the New Deal working rather than show the depression as it was? R: Did any of that ever come from Tugwell or did it come from elsewhere? I’d say the Department of Agriculture. R: Were you able to resist that pretty much? R: Did you ever get involved with any of the other departments? Did they ever try to interfere? We offered our services to them, but they didn’t seem to need them or want them. There are things I would’ve liked to have done for them. But we had about all we could do anyway, so I just stayed away. We made offers. We wanted to be reasonable. I went over to some of these places and said, “Look, are you in need of sometimes some special job when we’re out on something? Could I be of any help to you if you knew where we were going to go? You got a project?” But they did pretty good jobs themselves, so I didn’t see any reason why we should get messed up in that. R: Once you got started, got organized, did you have any serious budget problems? Yes. We had to scrape several sides. Not too much. I’m going to back down on that. We were fortunate. We got money. Tugwell was very clever. He got the money. We had very little trouble. R: Do you think that the amount of money you had, in any way influenced the kind of project you did, except in volume? Were there any that you would’ve liked to have done, except the money wasn’t there? Oh, of course. I know there was times when we wished we had a little more money, but on the whole I think we got all we needed — all we were entitled to. I don’t think we ever suffered, to tell the honest truth. That’s a strange thing to say, but I really do. I think we were most fortunate in the budget we got when we finally got rolling. When I think of what we did out on the open plains, the amount of money we spent and what we did, I think we were well treated on budget. D: How did you personally feel about the New Deal in that period? Well, I guess I was for it. In fact, I know I was. R: Did anybody ever ask you your politics as part of the job? R: Did you have much, if any, direct contact with the White House? Indirectly. Jonathan Daniels was the in-between man. He took care of me more than once. He covered us. K: What types of problems did you have with the White House? Oh, once in a while, budget. Once in a while, the kind of pictures we took, where we were going. He knew exactly — I reported to him regularly — what we were doing. Took him the pictures and talked to him about it. So he was in a position to answer questions. He saw the pictures, most of the pictures, and he knew what our projects were. K: Did you have to go to him, say, with the problem of “The Skull” — the Rothstein photograph? K: Do you feel that all the publicity about that photograph benefited you? K: What was public opinion like in relation to this incident? Very little. The local newspaper was the only one. I happened to be told about it when I was up that way. R: Did you ever have the feeling that the President or anyone in the White House had taken any special interest, in your project? R: Were they generally sympathetic? R: Did you like Roosevelt? K: What did you think of him? Well, I liked him as a man. The things he stood for. That’s all I can tell you. If I was just a citizen, I’d vote for him and I’d be in back of him. If I had a little extra money, I wanted to contribute to him—I’d contribute to him. That’s all. But, you see, I wasn’t in that area. I was down low. I was down with these pictures. But I respected Roosevelt. I liked Roosevelt. And I liked Jonathan, because I happened to have had a hitch with him. Something happened that gave me a chance to see him and talk to him and he understood some of the things that I was doing. It wasn’t trying to get anything. It just happened. He asked me to bring over some pictures and I took them over, and he said, “I like them.” That was the end of our relationship. I never bothered him. R: Over the period that you were doing this FSA work, do you think there was any kind of a change, whether major or minor, in the kind of thing you did? Were you doing the same kind of photography with the same kind of interest later on that you started out with, or did you make changes? Well, I think the way to answer that is that there was a growth. We didn’t make it change suddenly — we grew. The man grows up — he reads, he studies, he meets people. He talks — after a while, he’s changed a little. He talks differently. And then after a while he brings a new subject in and he talks about that. I think that was what happened to us. Do I get my point across? R: You developed your style? R: When you left, do you think it was still changing and maturing? Did it continue or did it die? Well, the Department of Agriculture didn’t want any part of us. That’s number one. I thought we had about tripled our job and it was time to quit. The job is never done. But, I thought the time had come when I had to quit and when I thought that we had accom¬plished sufficiently that I could afford to leave. I’m not trying to be critical. They had their ideas and they’d been there a long time. I’m not blaming them at all. I’m simply saying that I thought we had had a glorious time, we’d had a marvelous opportunity; we’d been given funds to work. And I thought it was time to quit — to end this job and say, “This job has come to an end.” Someone could pick it up and change it over. It was exactly as I had hoped — that somebody would pick up a new version and would come in. I didn’t know what was going to happen. But I knew that I was going, because I thought that I had everybody exhausted. R: When and why did you finally leave Washington? Well, we had piled up an enormous number of film. We’d covered so much and I began to feel the pressure. Tugwell was getting fed up and I think he was ready to go. Then I saw the shadows of the goddamn guys that were on the stand, centered in the Department of Agriculture. They were narrow-minded, some of them, and they had their jobs. And they had nothing of what Tugwell had and nothing of what the rest of us had. And I saw it coming. We had piled up a lot of pictures and had done an awful lot of work — it was time to get out. I had a very wonderful time. An assistant to the secretaries, he’d come out of the South, and he’s still alive, was my mentor. He protected me. He liked me, and if I had trouble, I’d go to him. He saved my life time and again. R: What did you do when you left Washington? R: Was there opposition? Did they try hard to keep you? No, because I was pretty quiet about it. And the ones who got it first were ones who had heard about it — a couple of congressmen. And those who knew about it said, “We understand. We think you’ve done a great job.” One congressman said, “We think you’ve done a superb job.” They were very sympathetic about it. This man told me something I never will forget. He said, “You know, you’ve got sense enough to know when it’s time to quit.” I’ve never forgotten those words. R: Where did you go then when you left? Well, you see, my friend, Ed Stanley, had ideas. And he was, at that time . . . with the Standard Oil Company. So, when I went up I had [it] all fixed up. R: So, you made the move easily on that one. Absolutely. That turned out to be a good move. K: How did the Standard Oil project develop? It was kind of hard on some of the old-timers in there who had just been having newspapermen take pictures for them without much thought. But, then we went in there and began to do a new kind of photography. They were a little disturbed. R: What, from the beginning, were you thinking of accomplishing with this Standard Oil project? Well, I thought Standard Oil was an exciting thing; running oil. They gave me a quick trip down. I saw those drillers — fascinating people, a fascinating spot. I saw the oil coming up, down in the bayous down in Louisiana. I saw that and I said, “By God, something can be made of it. And oil is damned important.” I knew about this tie in Arabia. I knew what our Alaskan situation was. I was sure that we could do something with it. R: Is it possible to say that you liked working with Standard Oil more or less than you did in Washington or were they different types of experiences? Different types. I enjoyed my time with Standard Oil very much. I enjoyed working with my staff. I enjoyed making the pictures. I enjoyed the people that came to get the pictures. First of all, it was a technical thing, more technical than anything we had ever touched. But with it all, it was still done by human beings. So those are two things that were in my mind. It had no comparison with some of the things we were doing for Farm Security. It was a technical job. They were getting that oil. And yet, you take drillers out of derricks where they were drilling and it was more like a Farm Security project. K: When you prepared your photographers for Standard Oil to go out in the field, did you prepare them in a different way than you did for FSA? Did you use scripts? Sure. If a photographer was going out, I’d write a page or a page and a half and give him some ideas. He came in and talked about it. K: Did you want your photographers to read about the areas they were going into? Oh yes. Now this boy was going to Arabia and he had about two weeks to get ready to go. I said, “You’re going to Arabia; you’d better damn well get yourself ready.” He did. He just dug in. When he went there, he came back with a damn good set of pictures. K: Were you interested as much as you were in FSA? Sure. The newspapermen had done such dull pictures of people. You see, they weren’t even good newspaper photographers. They had no editors that were good editors. They just dragged out lousy pictures, passed them out, and they didn’t get any publicity. It’s as simple as that. A big refinery is a beautiful piece of architecture, but there’s the most interesting people there. K: The print quality of the Standard Oil photographs is a little better than the FSA photographs. Yes. We had a little bit more. We had a marvelous laboratory. We had a laboratory that did our work for us in New York. It was run by a little old guy. He turned out stuff that was just terrific. He was one of the nicest guys I have ever known in my life. He was Achilles. Everybody called him Kelly and he was loved by everybody. He was a wonderful technician and a wonderful person. K: When a photographer went to a new place, who could guide him when he got there? Now when he went to Arabia, he needed some very careful backing because it was a long way off and there were special problems. I had to find somebody in the Standard Oil Company that could help me protect this guy when he got down there and make sure that he didn’t make any blunders. When he got there a man was waiting for him. He knew who he was going to meet. They knew damn well that this guy knew what he was doing, could protect him, and cover, and get the picture he wanted. And we got them. R: How many photographers did you have? I suppose that we had, at one time, about six photographers, when things were going heavy. K: Why did you go from Standard to Jones & Laughlin? Well, because there was nothing more to do. D: Did you do any urban documentary around Pittsburgh? The town and such? Oh, yes. Sure. A lot of it. R: Was there any difference about what you did for Jones & Laughlin and what you did for Standard? It was a different industry and the kind of pictures we took had to be different, because the whole element was different. H: Of the photographers who worked for you under Farm Security, did anyone besides Russell Lee ever come back and work for you again? Russ came back and worked under Standard Oil. Did Rothstein? No. He was out. It was all new people. R: How long were you at Jones & Laughlin? Was that your last job? That was my last job. I would say that I was at Jones & Laughlin not more than two years. H: You didn’t move out to Montrose though until the mid-sixties. You lived in New York for a while? H: Didn’t you occasionally go out to Missouri and help Cliff Edom with his seminars? Yes. Cliff Edom was out at the University of Missouri. He ran a very interesting program of seminars. I went out on two or three of those. H: They’ll take really experienced photographers, they’ll have real experts in, and then they’ll have young people that are just getting started. And they’ll take a little town around there and do a documentary on the whole town. They send you out every morning with three rolls of film and an assignment. They develop the film that evening and project it. Then Cliff and people like this man proceed to just shred you in little pieces. I thought that was just marvelous. He’s really a brilliant guy and he has talent galore and he’s a marvelous teacher. H: Now you really kind of helped to set up that program, according to Cliff. Well, I helped him a lot. He helped me, too. He broadened me. And he depended on me a lot, so I was always glad to go out. I enjoyed it so much. K: Obviously, you’re very good at encouraging students. I think that from seeing the way you responded to the people here. In talking to students or to young photographers, developing or starting out, what kinds of advice would you like to give them? That’s what happened. A lot of them came down and wanted to talk. They wondered what I was doing. You’d be surprised how many people came down to interview me so they could put it in their files in Detroit or something. This man came down and I’d forgotten all about it, and he came up suddenly with this script. I said, “Jesus Christ Almighty,” and all of a sudden I almost fell out of my chair. H: I didn’t see you for four years. I played it all with Walker Evans. I just disappeared and did it. When he gave me that copy to read, all of a sudden it all came back and I couldn’t hardly believe it. But he was one of the unusual ones. But that’s the way that I think you have to go about it. R: Let us ask a question I think people would probably like to know. How did it happen that your photographs came to be here at the University of Louisville? You see, I had run into Bob Doherty incidentally somewhere, when I had them moved back to Colorado again, and I had run into him. He was just starting to collect. I had seen some things he had and I didn’t know too much about him. For some reason or another, he stuck in the back of my mind. Then when we moved — it was about this time that we were closing down and my wife and I were headed back home again — back into Colorado, I began to wonder — when I left, I left all the negatives in the Library of Congress. I had an enormous amount of stuff shipped — it came with me. Stuff I was saving and stuff I’d hung on to. What the hell was I going to do with it? When we arrived in Montrose, you’d be astounded at the number of books I sold Bob Doherty. I’ve got the list of the books I sold. He bought a lot of the books because I had to get rid of that stuff. You remember our upstairs, I think. D: There was a marvelous collection. Oh, yes. Good God, I saved everything. I had the stuff I carted out to Colorado. The stuff we hauled out to Montrose is just astounding, really and truly. You know, that upstairs I had out there was just filled with stuff. Then, I had just run into Bob Doherty, and then for some reason or another I sensed that this was the place I could send and I began. My wife was an orderly woman, and she began to organize things and get them into shape again. When I moved in this place out there in Colorado, she began to do a lot of work and I remember she got a lot of stuff out and said, “Why don’t you send this stuff to this Mr. Doherty? Maybe he would like this.” That is really how the start came, by trying to get some order out of this stuff. I remember when she said, “Why don’t you let me get this stuff together and organize these films? We’ll send those down to him. It might be a good place for you to have these.” She was the one that thought about it and she was the one that did it. She was the one that could see all this confusion of mine and she was worried. She began to get this thing collected. So, I can give my wife the credit for that. In editing the original transcript of the interview, every attempt was made to retain the actual statements of Roy E. Stryker (1893-1975), but for the sake of compression and readability, and to avoid redundancy, words, passages and even whole sections of the interview were omitted. In some instances, words were inserted in brackets for grammatical purposes or passages were transposed for the sake of continuity. Questions often reflect the conversational character of the interview and are less in the nature of actual questions than they are responses. A number of people were involved in the editing of the manuscript, including two of the interviewers. Jay M. Kloner, Director of the Allen R. Hite Institute, University of Louisville, edited the text. Carl G. Ryant, Director of the Oral History Center, University of Louisville, read the original text and the final, edited manuscript. In addition, Marsha Bruggman, Research Assistant at the University of Louisville Oral History Center, compared the original tapes with the manuscript for possible errors and also typed the final manuscript. The other interviewers were Robert J. Doherty and F. Jack Hurley. Doherty is now Director of IMP/GEH. At the time of the interview, Director of the Hite Institute, he was directly responsible for establishing the Photographic Archives at the University of Louisville. Hurley is a member of the History department at Memphis State University and author of Portrait of A Decade (Louisiana State University Press, 1972), a study of Roy Stryker and the depression-era Farm Security Administration (FSA). Copies of the original transcript and interview tapes are available through the Oral History Center, History Department, University of Louisville, Louisville, Kentucky 40208. Posted in Documentary, Interviews and tagged Farm Security Administration, Interview, Interview R, Roy Stryker.